There is so much happening in Jozi during this week and over this week-end, that it’s hard to make choices and know how to fit it all in. 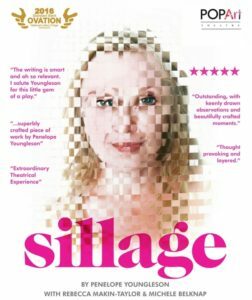 An intriguing play about women told by a woman has the evocative title Sillage. Sillage is a French word used in perfumery to describe the scent left behind when a person walks past/has left the room. I love Penny Youngelson’s intelligent and thought-provoking interview https://www.youtube.com/watch?v=SzrEiiU9pxg Sillage won the Standard Bank Gold Ovation Award at the 2016 National Arts Festival; it was also nominated for Best New South African Script at the 2017 Fleur du Caps. Billed as “the disquieting story of three generations of South African women and how their matriarchy sustains them”, the play is about a relationship between a mother and daughter packing up their family home. “They bicker over what to keep and what to throw away; and arguments about the minutiae of their lives quickly turn to the flotsam and jetsam of their relationship, family, community – and South Africa as a whole”. It stars Michele Belknap and Rebecca Makin-Taylor. Stay at our well located Guest House and experience Johannesburg activities. View our Rosebank Guest House for Rates and Availability! Being launched this week is Ray Hartley’s book Cyril Ramaphosa: The Man who would be King about the talented negotiator, trade union ghuru turned big business capitalist. Ray Hartley attempts to answer the question of whether ‘the man in the middle can lead from the front’. This should be a fascinating insight into how Ramaphosa has handled the challenges thrown to him by the unions, by business and by politics. Anthony Butler’s biography of Ramaphosa sits on a bookshelf in Liz at Lancaster’s library which, like many other thick tomes, is waiting to be read by osmosis, so this will be yet another viewpoint! 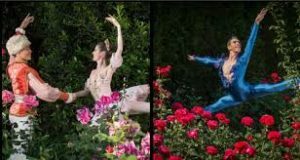 Booking: Phone Edgar Moagi on 011-877 6898; email edgar@joburgballet.com; or in person at the Joburg Ballet offices. NB No booking through Joburg Theatre’s booking service. Parking: across the road at the National School of the Arts in Hoofd Street. 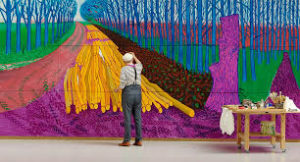 Opening on this weekend (but for 4 viewings only) as part of the Exhibition on Screen series is the film on David Hockney, probably Britain’s most popular artist. This documentary focuses on 2 blockbuster exhibitions held in 2012 and 2016 at London’s Royal Academy of Arts. Not only is it a wonderful way to access these exhibitions and his work, but it also features in-depth interviews with the artist. This looks like a must-see. The Suitcase which has returned from a 5 week tour in the UK (to huge acclaim) closes on the 26th November. Adapted from Es’kia Mphahlele’s short story set in the 1950s, James Ngcobo wrote the script in 2006. I saw it some years back. It’s a powerful and poignant play about a young couple in love who despite family disapproval, leave for the city to make their way in life. The pressures of the city, unemployment and poverty erode the husband`s self-esteem. Desperate to provide for his pregnant wife, he steals a suitcase left on a bus. And it is on this action that the rest of the play unfolds. WHEN: 21 -25/11 at 8 pm and 26/11 at 3 pm. 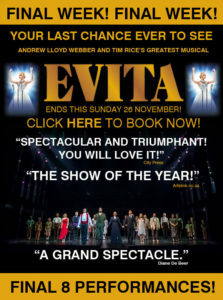 I was privileged to see Evita this last week-end. What powerful theatre and such creativity in terms of stage production. Rice and Webber’s Evita is iconic. Emma Kingston’s rendition of “Don’t Cry For Me Argentina” is extraordinary and “Another Suitcase, Another Hall’ sung by Isabella Jane as Peron’s ousted mistress, is sublime. The Daily Maverick didn’t give a favourable review and many comments suggested that Emma Kingston’s voice is strident and harsh. However, I found her powerful and appropriate for the part, as well as incredibly convincing as a withered terminally ill 33 year old woman at the end of the play. I found every minute mesmerizing. And there are still 8 shows left. There are four showings only, starting this weekend of Strike a Rock. 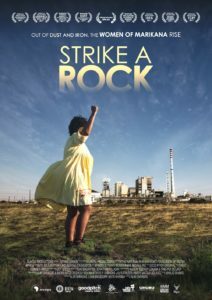 While Rehad Desai’s Miners Shot Down told the Marikana Massacre from the miners’s perspective (along with archival TV material and interviews with the legal team), Strike a Rock is told from the perspective of the women affected. Two grandmothers grandmothers Primrose Sonti and Thumeka Magwangqana want to find justice. 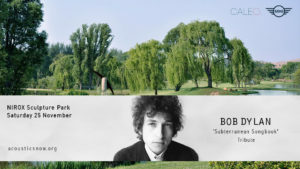 And as if this isn’t enough, there’s another wonderful opportunity to get out to Nirox in the Cradle What better way to spend a chilled Saturday than listening to a full day concert of Bob Dylan songs. Acoustic collective Dayne Rothbletz, Jon Shaban, Adelle Nqeto, Lucy Kruger, Shotgun Tori, Tubatsi Moloi and Jamie Acheson will entertain with guitar, violin, bass, lap-steel slide guitar, flute, percussion and voice. Sooooo … you see what I mean … we have to make serious choices this week-end. « 2017/2018: Live HD screening season of the NY Met Opera is here again.